Meet Grace Kennerly, A Far Cry's Executive Director! The former Director of Admissions and Artistic Planning at Boston University Tanglewood Institute starts on November 5. Boston’s Grammy-nominated string orchestra A Far Cry has announced Grace Kennerly as its new Executive Director. Kennerly, who begins her new position on November 5, has been Director of Admissions and Artistic Planning at the Boston University Tanglewood Institute, where she led the development and implementation of all BUTI summer season programming and admissions. After spending one year as a program administrator at BUTI, Kennerly rose quickly to a director role. A violist by training, Kennerly has taught at the Dedham School of Music as well as an El Sistema-inspired program in Durham, North Carolina. She reveals her entrepreneurial spirit through her past work as co-founder of Vinyl Records, a student-run record label at University of North Carolina at Chapel Hill, her undergraduate alma mater. Grace Kennerly is thrilled to join Boston’s A Far Cry as Executive Director. In her previous role as Director of Admissions and Artistic Planning at the Boston University Tanglewood Institute, Kennerly was responsible for the recruitment of more than 400 of the world’s most talented young instrumentalists, singers, and composers. Coordinating with the Boston Symphony Orchestra and Tanglewood Music Center, she also oversaw the development and implementation of artistic programming of 23 individual curricula and related personnel for each summer season. Kennerly continues to perform as a freelance violist in the Boston area and formerly served on faculty of the Dedham School of Music. While living in North Carolina, Kennerly regularly subbed for the North Carolina Symphony Pops and North Carolina Ballet, as well as performed widely as a member of the Amazon Quartet. She was also a violin and viola teacher for the launch of KidzNotes, North Carolina’s first El Sistema-inspired program. As a performer and administrator, Kennerly feels equally at home outside the classical music genre. A versatile session musician, her playing can be heard on tracks by indie artists, such as Lost In The Trees’ album A Church That Fits Our Needs, or on stage with folks like blues guitarist Reed Turchi. Fueling her enthusiasm for discovering new artists, Kennerly cofounded Vinyl Records in 2007, signing and promoting student bands in Chapel Hill, North Carolina. She holds degrees in viola performance from Boston University School of Music, University of North Carolina-Chapel Hill, and University of North Carolina School of the Arts. Boston’s Grammy-nominated string orchestra A Far Cry’s twelfth season lives up to its “reputation for top-drawer playing, engrossing programming, and outstanding guest artists” (Boston Musical Intelligencer). The season includes nine Boston-area concerts as part of the group’s own series (with performances at St. John’s Episcopal Church and New England Conservatory’s Jordan Hall), and three pairs of concerts as part of A Far Cry’s long-standing residency at the Isabella Stewart Gardner Museum. Continuing on the ongoing success of their recent release, Circles, which debuted at #1 on Billboard’s Traditional Classical Chart and was a NPR darling, A Far Cry and pianist Simone Dinnerstein perform together both in Boston and on the road. Evliya Çelebi (çelebi: a title of distinction during the Ottoman period meaning ‘gentleman’) was an unusual Ottoman traveler, known today largely through his exceptional travelogue, the Seyahatname, probably the longest travel account ever written. Born in Istanbul in 1611 Evliya was a curious and an unconventional person who was educated in the Ottoman court. His is a sophisticated depiction of the known world through the eyes of a 17th century Ottoman Muslim; it has drama and color, darkness and light as well as tragedy and humor. Indeed, when these days the stereotyping of Muslims is so common it is this expansive cosmopolitanism I found in Evliya’s world that inspired me to compose this concert piece. I am convinced that anyone who enters this fascinating world will come out of it changed. The four qualities I chose to emphasize from Evliya’s travelogue are the scientific (based on observation), the tragic, the fantastic, and the historic. While all excerpts share an element of fantasy (i.e. one hundred thousand men at Kaya Sultan’s funeral, Alexander with two horns, etc.) there is still a distinction in Evliya’s writing between the real and the surreal. For example, to preview the stories that inspired two of the movements you will be hearing, Ottoman Muslims truly believed that Alexander was a prophet who possessed two horns (4th movement); whereas the vegetarian dervishes of the 3rd movement are a completely made-up story, so far as we know. In fact, this has been a constant subject of debate among historians studying Evliya: what is real and what is not? In the end, no matter which quality he may be reflecting on he is always a storyteller, prone to exaggeration; observation is always amplified to better communicate the subject matter. So, in the first movement, we may think that Evliya is exaggerating when writing about the “clocks in the forms of various creatures, with moving eyes, hands and feet” (see the excerpt in the first movement below) but, it turns out that there really were such clocks back in 17th century in Austria and Germany! In order to best reflect on Evliya’s dizzying scope as well as the richness of 17th century Ottoman culture, I have incorporated an unusual variety of musical styles and solo instruments in this composition including concert music, jazz, African polyrhythms and various types of Turkish music. While the first movement, “The Clocks and Bells of Vienna”, is influenced by Bartok and features the oud and percussion, the second movement, “The Death of Kaya Sultan”, is a jazz ballad with piano. The third movement, “The Vegetarian Dervishes”, is a mixture of Turkish Sufi and African musics featuring the ney (end-blown flute), whereas the fourth movement, “Alexander the Great”, incorporates characteristics of classical Ottoman/Turkish music followed by Koranic chant which is then followed by Penderecki-like new music. However stylistically eclectic the piece may be, the four movements are based on the classical symphonic structure: a fast first movement in sonata form, a slow ballad for the second movement, a triple meter third movement (in this case alternating between six beats and three beats), and a fast last movement with which I take the most liberties inspired by the programmatic nature of the text. In the end, my aim was to create a musical world as rich, colorful, diverse, and cosmopolitan as Evliya’s amazing travelogue. Ultimately, through this piece, I am aiming to be a 21st century Evliya. “Kaya Sultan’s months and days were fulfilled, and all the sultanas and sisters and friends, and all the experienced women and skilled midwives of physician-like disposition were present at the time of her delivery. God be praised, as on that blessed night forty complete Koran recitals and forty thousand invocations of the Prophet were being recited, Creator of the universe, God brought forth from Kaya a pure-starred daughter just as He had brought forth Salah’s she-camel. There were joy and celebration that night both in the Eyüb Sultan mansion and the city [Istanbul] until the morning by which time the pasha had given away ten purses as alms. Kaya Sultan also gave forty purses, and five hundred men were clothed in all sorts of garments after which they offered benedictions. In sum, if they were to compose an elegy of a thousand verses for this Kaya Sultan, they could not even begin to describe her noble character and pleasant disposition”. One of them was riding a majestic rhinoceros… And the other one was riding an animal definitely not different than a mule but with thin black horns by the ears… Since we had camel meat and chicken I offered good food but they cried “no, we gave up eating those once living seven years ago”. I asked what the reason was, so they cried “we, three brothers, were traveling from India to Ethiopia on Indian ships when Portuguese infidels took our ships and jailed us as slaves inside the hold of a ship. The Lord works in mysterious ways: when one of our brothers died they made kebab out of his dead body and made us eat him – during an entire month we both ate him – but, after a month, while journeying in the ocean a storm destroyed our ship and we were able to escape to a great island where we purified our bodies in a river, offered two prayers of gratitude, and swore never to eat those who had souls. That’s why.” And they continued “the next day, these animals came to us in a friendly manner and by way of sign language asked us to ride them. So, we have been wandering with these animals during the past seven years”. “According to the true reports of, first of all, the historians of Greeks, Arabs and Persians; and the true historian Mıkdisi son of Bey Hakı-i Yarmeni; and his excellency Sultan Şerefeddin-i Abbasi, author of the Şerefname and the forefather of the noble Khan of the Abbasid dynasty: since Alexander had two horns of firm flesh on his forehead he was called Alexander the Zülkarneyn [lit. two-horned]. According to some, thirty-two years is called a karn and the sphere of the universe revolves once in thirty-two years. Since Alexander experienced two such karns or global revolutions, they called him Zülkarneyn but, karn also means horn in Arabic. So, the most correct report is that he was called Zülkarneyn because of his horns. However, Alexander could not get one hour’s restful sleep because of the pain from these horns, and none of his physicians could find a cure for it. Finally, while he was searching for a cure according to the suggestion of his physicians and scholars this blessed revelation from Lord God came upon Alexander: “O Zülkarneyn, Gog and Magog are ravaging this land.” [Koran, 18:94] Following this blessed command he went with all his doctors and physicians seeking the water of life to the land of darkness, passed beyond the sea of darkness, built the wall of Gog, and on his return he expended much effort again seeking the water of life for the pain of his horns and for eternal life; but when he found no trace of it he despaired for the cure of life and washed his hands of it”. *All of the above excerpts from Evliya Çelebi’s Seyahatname (The Book of Travels) were based on translations by Robert Dankoff which were further edited by Mehmet Ali Sanlıkol. I would like to thank my wife, Serap Kantarcı Sanlıkol, for her everlasting support and encouragement; my mother, Fethiye Sanlıkol, for setting me on this path as my first piano teacher; Carole Friedman for believing in my music and watching out for me; Robert Labaree for always coming to my help whenever I need him; Fatma Durmaz Yılbirlik for providing unconditional support toward my music; the TBF LAB grant team for understanding the importance of this project; and to all the criers for inviting me into their wonderful circle once again. John Corigliano is arguably one of our era’s most prolific and protean composers. Throughout his career, Corigliano’s works have moved audiences in both concert halls and movie theaters, garnering multiple Grammy Awards, an Academy Award, the Pulitzer Prize, and other honors. In addition to his work as a composer, Corigliano has instructed and guided numerous young composers as a member of the composition faculty at the Juilliard School, and elsewhere. Les Indes galantes (“The Amorous Indies”) premiered on August 23, 1735 in Paris. It was the third opera for Rameau, who had made a name for himself as a music theorist a decade earlier, then increasingly gained recognition and respect as a composer, first of harpsichord suites, and then opera. Elsewhere in Europe, Johann Sebastian Bach had recently celebrated his fiftieth birthday. Unbeknownst to either of them, the Baroque era was reaching its pinnacle—and now even had a name. The composer was fifty years old in 1733 when he finally had the opportunity to make his debut as an operatic composer with Hippolyte et Aricie. It made an indelible impact, and it was the reviews of the opera as “baroque” (misshapen) that became synonymous with both the composer and his time. Les Indes galantss was performed 64 times in the two years between its premiere and 1737, and underwent numerous revisions and changes over the next almost 30 years. The opera’s main literary conceit, told over the span of four acts (or “entrées”), is transplanting stories of mythological figures and the paths and fates of humans in love from European settings to the “Indies” (i.e. somewhere “exotic”). Specifically, these locales include an island in the Indian Ocean, South America, the Middle East, and North America. The last act, set in North America, contains one of Rameau’s most recognizable tunes Les Sauvages, which made its first appearance in his harpsichord suite in G major (RCT 6) approximately nine years earlier. It was directly inspired by the 1725 visit of several Native American tribal chiefs to the court of Louis XV and the tribal dances at they were invited to perform at court. Often described as “visionary” and “distinctive,” the works of Claude Vivier are a testament to the vivid imaginative qualities held by this Canadian composer whose life was tragically cut short when he was murdered in his mid thirties. In the end, he left behind a rich catalog of around 50 works, which include a variety of genres (and an invented language). Perhaps the greatest influence on Vivier was his period of study with Karlheinz Stockhausen, the result of winning a scholarship to study in Europe when he was twenty-three years old. This weekend's concert set brings music and visual art right next to each other, with each work inspired by a painting. You'll hear the music - but here's your chance to take a good look at the art! 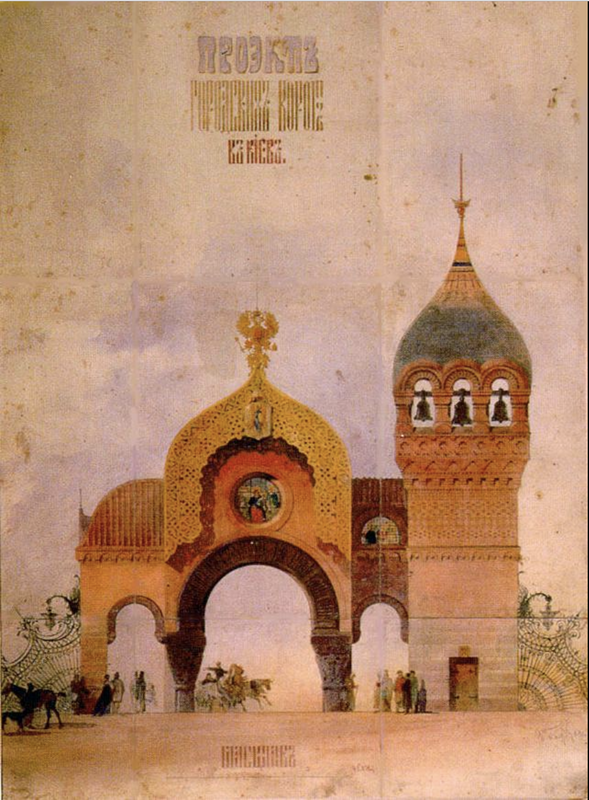 Mussorgsky's amazing work brings a set of portraits by his friend Viktor Hartmann to ravishing life. Below are two of the surviving pieces (many are lost) - representing the Great Gates and the Ballet of the Unhatched Chicks. More info on all the pictures can be found here. William Grant Still's exquisite "Mother and Child" was inspired by this mesmerizing work by Sargent Johnson, residing in the SF MOMA. Respighi's "Botticelli Tryptich" focuses in on 3 sublime paintings: Spring, The Adoration of the Magi, and The Birth Of Venus. 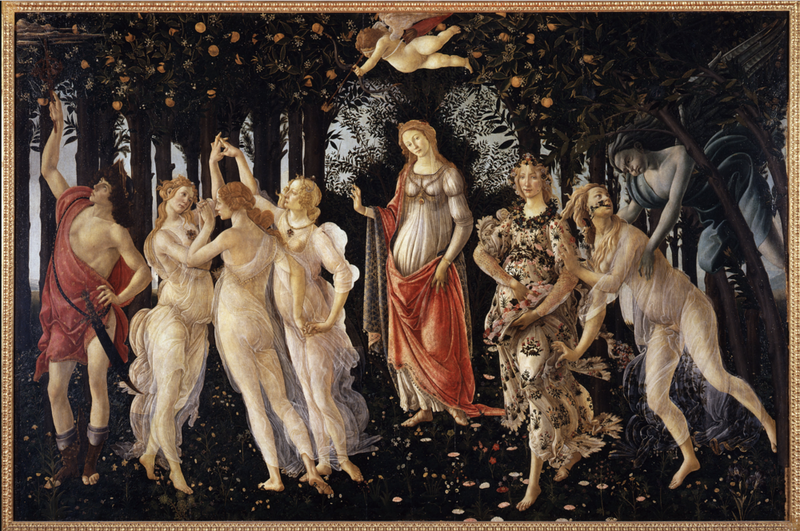 It's a match made in heaven, Respighi makes music sound straight-up ravishing, and Botticelli's works already have us swooning. 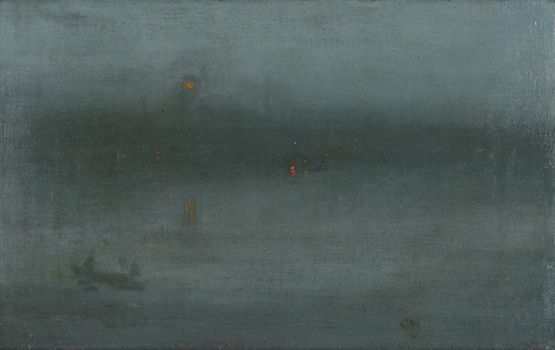 Finally, Jessica Meyer's "Grasping for Light" references Whistler's "Nocturne: Blue and Silver, Battersea Reach. You can look at it here, but... if you're seeing this concert, you'll be at the Gardner Museum, so if you possibly can, go stand in front of the original and take it in! A Far Cry is thrilled to be presenting a world premiere written by Jessica Meyer in our season opener this weekend at the Gardner Museum. Jessica's an inspiration to all of us; a brilliant composer and violist whose works have a freshness that allows you to "see" differently while you're listening to them. She spent a week with us in the Gardner Museum last spring, and this new piece, titled "Grasping for Light" started to emerge. We asked her some questions, and boy, did we get answers! You started thinking about this piece last spring, on a week-long residency at the Gardner. What was it like to spend that time in Isabella's space; what struck you? Isabella's space is simply... amazing. To have art grouped together in such a beautiful yet specific way provided such a thought-provoking context. It was an honor to live in the museum's apartment for a week, to wake up and read books about her and the artists she chose to surround herself with, and to visit (and revisit) the different rooms throughout the week. I have since been to Venice and saw the palazzo that was her "home away from home". The best part of all is that I got to know an extremely interesting person whose personality was as large as her collection. "Grasping for Light" references a Whistler painting; what's your experience of the painting, and how do you think it might differ from Isabella's? Upon arriving, I was concerned that the collection was going to overwhelm me and that choosing just one (or a few) works for inspiration would be a struggle. However, on the first day, from the moment I entered the famed "Yellow Room", this painting just sucked me in. I stood in front it slack-jawed for quite a while, and knew without a doubt that it would be my inspiration. ..."when perplexed by an annoying problem" she liked to go and "sit quietly before a beautiful object . . . the problem tended to solve itself in the process." One such beautiful “object” was James McNeill Whistler’s Nocturne, Blue and Silver: Battersea Reach, considered a bold purchase in its day for its daring abstraction and supposed “lack of finish.” But surely that’s what attracted Gardner most. Here was an acclaimed artist thinning his paint and quickening his brush strokes not to obscure the Thames night scene, but rather to depict it more accurately through a cloak of fog. It was mesmerizing. Many people did not appreciate Whistler's work at the time - feeling it was too stark or thrown together. However, I read that his use of color routinely caught her eye, and she defended his choices often. For me, my first experience of the painting was intensely emotional, which might have been different from Isabella's. 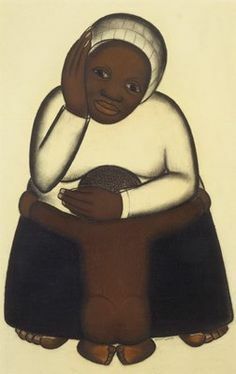 Would you describe the genesis of the work and its inspiration? Besides the mesmerizing effect the painting had, I was struck by how dense it was, and how the subtle layers drew you in. However, I also came to see it as a metaphor - specifically about depression. My father had just died a few months before my residency, and the depression that follows such an event can make you feel like you are trapped in that very fog you see in the painting. It can be so debilitating. It's as if you are wearing ten leaden dentist aprons at once and can't move. As I found out more about Isabella's life and how her collection came about, I discovered that she had a son who died while he was a toddler. He was her pride and joy. Upon his death, she became depressed for quite some time, especially when it was clear that she could not have another child. Eventually, the doctor simply prescribed "travel" as the best antidote, after which she discovered the world and her passion for art - so much so that she started routinely buying it. Essentially, it was out of this darkest time she discovered what she was meant to become. In the Whistler, you have these tiny specs of light colored paint that draw you through the fog the longer you look at the work. The work I have written for A Far Cry uses sound to express the different feelings related to getting through a physical and mental fog in order to emerge on the other side of the river where the light is. Does "Grasping for Light" feel like a natural part of your "catalog of works" or is it an outlier in some way? In one way, I feel it is a natural part of the collection of works I have written so far because it uses almost all of the compositional techniques I have been developing over the past few years. I enjoy varying ensemble textures in different harmonic and rhythmic ways to express various emotional states, and it was really fun using the full palette of string colors I have come to know after so many years as a player. However, what could make it qualify as an outlier is that this is the first piece I have written for so many solo parts. What inspired you to write so many distinct solo string parts in this piece? Having played in many, many string sections throughout my life, there is one thing I find myself repeatedly explaining to my clarinetist husband: when winds and brass play in groups, often they are one on a part. Of course, they have to blend, tune, match articulation, etc - but everyone usually gets ownership of their own part. Conversely, when you are playing in a string section, you are almost always playing the same part with many people and it is a specific craft to be able to play in a section well. On occasion, I have performed in viola sections that were so tight that if someone was bouncing in a slightly different part of the bow with a slightly different kind of stroke, it was very obvious. One also usually has to know how different one needs to play when you are sitting in the front, middle, or back of a string section. Therefore, when a string orchestra is playing with the typical 5 sections, the energy is simply different than when everyone gets to have their own part to express. This was evident when I saw A Far Cry perform in Jordan Hall while I was there in March. Your performance of Beethoven's Op. 135 was gorgeous and elegant, but when you performed Strauss's "Metamorphosen - a study for 23 solo strings" ...the energy of all of you putting all of yourselves into your own parts blew me away. I know how that feels as a player, and I wanted to give you all the opportunity to be able to "go there" again. How does being a violist allow you to write the best music? (AKA does that "middle perspective) inform your work? For the past (*cough*) 30 + years I have been sitting in the middle of everyone as a violist. From that perspective, you get to hear most things equally from the bottom up, and your part is usually about being the glue between what the lower voices and upper voices are doing while influencing the phrasing and momentum as you can. This is probably why I am so fascinated by rhythm, counterpoint, and texture as a composer - because those are things that violists are often most aware of. What do you think A Far Cry will find challenging about your piece? And conversely, what are you looking forward to hearing? Having a piece that is so texturally dense at times will be a challenge for an unconducted orchestra to put together quickly (let's face it...time is always an issue). However, I made it so that the pulse just clicks along at the same rate - so once everyone is grooving in the same way and knows how it goes, it will be OK. I can't wait to finally get to hear it in rehearsal! There will certainly be things to quickly tweak in regards to color and individual dynamics to make it gel and that moment is always nerve-wracking, but that comes with the territory. However, I am really looking forward to hearing all of the expressive colors everyone can make, with the virtuosity that I know all of the Criers are capable of, while playing from the bottom of their hearts. Boston Voyager sat down with Sarah Darling to talk about the experience of being a Crier. Read the result on their site, or scroll down below! A Far Cry started as a collective twinkle in a lot of eyes. A bunch of like-minded musicians who’d converged upon Boston for grad school, back in 2007, started doing what we love to do most – getting together in our off hours and reading music for fun. The fun stuck. We discovered that we loved playing together, and that we loved playing as a big group. Next thing we knew, we were planning our first concert. What was so special about what I saw that day boils down to two words: shared leadership. Every single person on that stage was shining with the same energy, totally committed to realizing the music together, whether that person was in the front or the back. As soon as one piece switched to another, the back players moved to the front, and vice versa – and the sound of the orchestra totally changed as a new set of principal players took the lead and everyone else committed to following them. The palette was endless. It was magic! I ended up starting to perform with the group shortly thereafter. Behind the curtain, I learned how the magic was made. That communal intelligence came from long hours of rehearsal, and from a real commitment to lifting up all the voices in the group. Of course, everyone wanted to speak up during the process of preparing a program, and so we had to learn how to streamline our process. We allowed everyone just two comments, and you better believe that inspired people to think very carefully before talking! That rule also made sure that the introverts had as much of a shot at being heard as the extroverts, which was incredibly valuable, since of course everyone had something original to add to the pot. Next thing I knew, the A Far Cry members went on a retreat, and a couple days later, I got a phone call. “Would you like to join the viola section? Everyone here unanimously voted you in.” That was how new members were added – and still is. Every single person has to be on board. And when you join the group, knowing that everyone is on your side, it’s the best feeling in the world. That was the beginning of my adventure with A Far Cry. Eleven years later, it’s still unfolding. Ha! It has not been a smooth road! But it’s been a wildly wonderful one. We’ve had some rough times, but have also had some incredible luck. The one trait which has stayed constant from the very beginning to now, is the following. We’re artists and arts administrators, simultaneously. During a concert week, we’re “on” in rehearsal 10-5 each day, listening to each other, giving our utmost, and then, on break, we dive for our phones and put the final touches on e-blasts, field audience inquiries, go over venue seating charts, plan to meet with donors, post to Facebook, figure out about mike setup, you name it, we are doing it. Did I mention we rehearse standing up? Comfortable shoes are a must. So is a nearby source of coffee. Lucky breaks? They’ve come in for sure. The chance for an incredibly meaningful residency at the Isabella Stewart Gardner Museum. The support of a brilliant and energized Board of Directors, pretty much from day 1. A strong press presence in Boston that identified our “story” early and has kept listening over the years. A GRAMMY nomination in 2014 that put us on the map in a brand new way. Granting organizations who believe in us. And small miracles that unfold around us every day – soloists who take a chance on us, composers who trust us with their new work. It was pretty fun, for instance, to commission a piece from Caroline Shaw just a few months before she was tapped for the Pulitzer! It was pretty darn fun to start working with Simone Dinnerstein on a brand new Crier-led Goldberg arrangement and then hear from her that she’d like to premiere a new Philip Glass piano concerto with us and record it too! And struggles? So many. So, so, many. It is very, very, hard to run a nonprofit. Things are literally breaking all around you all the time. One unbelievably frustrating one that came out of left field was a letter from the IRS, telling us that they’d temporarily revoked our nonprofit status as a result of a perceived misfiling. A couple of audits later, it was revealed that we’d done nothing wrong. Unfortunately, by that time we’d lost half a year of fundraising and a whole grant cycle, which was financially terrifying. That’s the kind of situation that can break a group that’s bound together by goodwill – as everyone tries to solve it in their own way. We had a number of disagreements over strategy, and it wasn’t easy, but we made a concerted effort to stay focused and to stay together, and to OVERCOME. And we did. Alright – so let’s talk business. Tell us about A Far Cry – what should we know? What does A Far Cry do? I’d say: we create complete musical experiences. We perform music, but we’re also the program curators, and the co-artistic directors in every sense. And, we’re a functioning democracy, one that depends on the participation of its members, while challenging and elevating them. Our programming process, for instance, begins with a call for submissions orchestrated (no pun intended) by a group member called the Axle. Individuals can submit programs, or groups can workshop ideas together. Bit by bit, fascinating ideas flow in. They’re workshopped again by the whole group, then voted into a “Vault” that gets opened when it’s time to organize programming for the upcoming season. So many factors go into designing a season: program content, soloist availability, the “flow” of the season overall… and when we begin to design a season we usually have about 4 times as many programs as we have space for! To move forward, the Axle and the group work together to design a voting system that promotes clarity and preserves the will of the group. Flexibility is incredibly important. Trust is like gold. We use the same sorts of principles across the entire spectrum of our artistic activities – whether it’s making a recording, designing an educational residency, or simply deciding… anything. This democratic work, along with our commitment to rotating leadership, is, I think, the thing that lies closest to the heart of what makes A Far Cry what it is. But hey, if you ask another group member, you just might get another answer! Ever since the group’s founding, we’ve held on to three words: Love, trust, and respect. For a group like A Far Cry, where member responsibility (and agency) is so massive, those words are crucial – and they only work in conjunction with each other. Love without trust or respect is delightful but hollow. Trust without love or respect is meaningful but cold. Respect without trust or love seems to suggest a hard, hard, world. But together, they’re a formula that works. This is just so incredibly important when you’re working with others in a way that is both rational and emotional – as music-making inevitably is. How do you make decisions about how to embody a musical phrase? You have to be able to see through your partners’ eyes, to respect their work, to love the way they play, to trust the words they’re using to talk about Mendelssohn measures 14-17 or the Schnittke second movement. This is the DNA that makes our democracy possible, and gives our shared leadership life. Yet this temptation toward analysis [of the concert’s title] was shattered by the concert itself, which was such a human and heart-centered endeavor that I felt almost ashamed at having tried to approach it from the angle of abstract scholarship. With that, we finish our 11th season of music making. As I look back on our dozen years together, one point has become radiantly clear to me: A Far Cry cannot do this without you. You are our audience, our cheerleaders, and our family of supporters. We notice when you’re not at our concerts, as you notice when a few of us are missing from the stage. To me, that sentiment reminds me that all of us being there for each other—in harmony—truly matters. You get why we do what we do. In climates of upheaval and unrest, we strive for more transformative performances. Bringing inspiration, engaging our souls to rejuvenate our faith in humanity and in each other, and witnessing that in your eyes afterwards, is the most humbling work that any of us could hope to do. Through shared music, we feel deeply, shed tears of sorrow and tears of joy, and make meaning together. In the end, these are the moments that matter most, and we wouldn’t be able to experience them without you. Make a gift today in support of our next season of performances, upcoming recordings and more meaningful connection-making. I invite you to continue to be our ambassadors to the world and to the next generation. It means everything to us. We appreciate your generous support and we cannot wait to see you at our next concerts. Online gifts are accepted via A Far Cry’s website at afarcry.org/fundraising. Stock can be gifted to A Far Cry via direct transfer or stock certification. To donate stock, please contact Mary at 617-533-4887 or at director@afarcry.org. Donors age 70 ½ and older can make a qualified distribution of up to $100,000 from their IRA, and it will not be treated as taxable income. An IRA charitable rollover is a great way to make a tax-wise gift to A Far Cry! Contact Mary at 617-553-4887 or director@afarcry.org for more information.